Remove cod and scallops, pat down to remove excess moisture, salt and pepper to taste, and cut into small pieces. Warm a medium size saute pan on medium to high heat and add olive oil. Once pan is hot, add cod and scallops and cook for 7-10 minutes. Drain and set aside. Note: Pan will be used later. Turn down heat but leave on stove. Make seafood ricotta mix. In medium mixing bowl add ricotta, eggs, garlic, pepper, parsley, and grated Parmesan cheese. Gently stir until ingredients are blended and there is a smooth consistency. Transfer the ricotta blend to a large mixing bowl and add cooked seafood. Mix seafood and ricotta. Fill large pot with half gallon of water, add salt, and bring to boil. Lay out dough and cut circular pieces with a ravioli cutter. (If you do not have a ravioli cutter, use lid from Pompilio’s Puttanesca jar and cut around.) Add mix to center of cut dough, brush with egg yolk wash on edges, fold and pinch with fork. Gently place raviolis into boiling water and let cook for 3-4 minutes. Ravioli will rise to the top when finished. Reserve 1 cup of cooking water and drain. Heat saute pan to medium to medium-high heat. 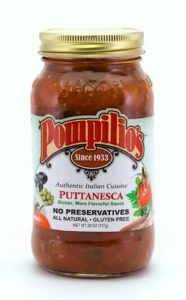 Add Pompilio’s Puttanesca and the cup of reserved pasta water to pan. Once warm, transfer ravioli to sauce and let cook for 3-4 minutes until done. Plate ravioli and top with Pompilio’s Puttanesca sauce.